Billy Martell is headed to Mass. Maritime. When he met with Whitman-Hanson Regional High head football coach Mike Driscoll to discuss his junior campaign, Billy Martell was told something he’d work tirelessly over the next year to make a reality. “Coach Driscoll said, ‘You’re one of a few kids who has the talent to play in college,’’’ recalled Martell. After an offseason consisting of many grunts, followed by a Patriot League All-Star season, Martell has committed to play football at Massachusetts Maritime Academy. Martell, who said he’s looking into studying emergency management, has had his eyes on attending the Buzzards Bay-based college since August. After converting to wide receiver as a sophomore, Martell transitioned back to running back this season and flourished, taking 73 carries for 518 yards and three touchdowns. His 7.1 yards per carry led the team. Martell had his best outing against Bridgewater-Raynham, gashing the Trojans’ defense for 104 yards and a score. On defense Martell, a two-year starting safety, posted 52 tackles and a team-leading three interceptions. “I just wanted to show everyone who I am this season,” Martell said. Martell said it was a rewarding season for him. Driscoll constantly lauded Martell’s speed throughout the season, calling him “the fastest player on the team.” Whether it was at running back or tracking down the ball carrier, Martell was instrumental in the Panthers’ success. Mass. 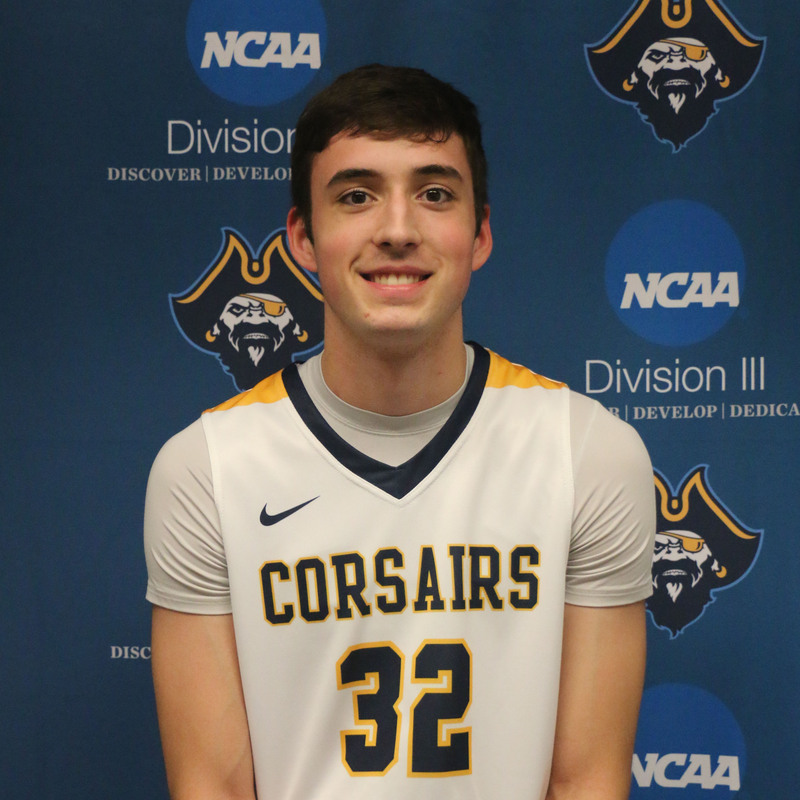 Maritime, which competes in the Massachusetts State Collegiate Athletic Conference of NCAA Division III, finished 2-8 last season. “I’m looking to work on my speed and improve my footwork,” Martell said. Sarah O’Shaughnessy takes the helm of the gymnasitcs team. There are alot of changes with the gymnastics team this season at Whitman-Hanson Regional High School. The first is the program is now a co-op with Middleboro, expanding on the two schools’ relationship that includes boys’ and girls’ swimming/diving teams. Secondly, Sarah O’Shaughnessy is the new voice of the club, taking over for Rachel Cohen-Sferuzza, last season’s Patriot League Coach of the Year. O’Shaughnessy has an extensive gymnastics background and has been coaching since the age 14. After residing in Florida for the past couple of years, O’Shaughnessy returned to Massachusetts in August. “Someone reached out to the director of mygym, Tammy, and asked her if she would be interested and since she coaches Notre Dame [Academy of Hingham], she was like, ‘I think you should do it,’” O’Shaughnessy said. The Panthers, who finished 9-4 last season with the help of regional qualifier Britney Blackstone, are led by senior captain Erin McCoy. With teamwork key in gymnastics, O’Shaughnessy said she’s aiming to create it between the two schools. Six of the team’s girls come from W-H, while the other four come from Middleboro. “It’s honestly about making it so the two teams are comfortable and knowing who their teammates are and everything and just have a good time, get to know each other,” O’Shaughnessy said. O’Shaughnessy said she’s still trying to figure out where the team is strength-wise. “They’re working together and there haven’t been any negative things, so,” O’Shaughnessy said. Other players from W-H include captain Joelle Puopolo, Kate Pihl, Adrianna Caperello and Madison Scaccia. The Panthers return to action Jan. 4 at 6:30 p.m. at Massachusetts Gymnastics Center in Pembroke for a league meet. The Panthers will be led by captains Ally Bartlett and Samantha Perkins. The Whitman-Hanson Regional High girls’ indoor track team is aiming to stay afloat as it works its way down a grueling schedule. With their multi-event experience and success, seniors Ally Bartlett (captain) and Dorothy DiMascio-Donohue and junior Samantha Perkins (captain) will boost the club. “All three girls can long jump, high jump, throw the shot put, run the hurdles and dash events and can run mid-distance events if called upon,” George explained. George said he is also counting on junior Courtney Woodward, sophomore Hailey Minicucci and freshman Skylar Jordan to fill similar roles of competing in multiple events. In the mid-distance and distance events, the Panthers will be led by the cross country team’s top runner, junior Tori Boss, and senior Maeve McDonough. Sophomores Izzy Amado and Anna Sullivan are also valuable pieces due to their versatility. It’s the sprinting, hurdles and relays that have been a focal point on improvement for George. The Panthers added former standout, Samantha Richner to their staff to build up the group. George said a few freshmen have caught his attention early on, but most namely Emily Hanrahan. The Panthers are back in action Friday, Dec. 21 at 4:30 p.m. against Hingham at the Reggie Lewis Track and Athletic Center in Roxbury. The boys’ indoor track looks to build over the season. Head coach Mike Driscoll’s expectation of his Whitman-Hanson Regional High boys’ track team is for it to show constant improvement. The Panthers, who finished the year 2-3 last winter, have some large voids to fill with the graduation of all four of their Div. 3 All-State qualifiers in Brian Edwards, Brett Holmes, Andrew Newman and Jack Ryan. W-H does return its fair share of talent. Senior captain Billy Martell emerged last season as one of its top sprinters and relay runners. This season, he’ll throw the shot put in addition to running the 55-meter dash, 300-meter dash, long jumping and running a leg of a relay. Martell, along with fellow senior captain Dan Kline, classmate Brandon O’Brien and junior Kyle O’Brien, are at the center of the Panthers’ strength – their sprinting. The distance runners are led by a bevy of cross country runners from the fall. Senior captain Shane Schraut, a boys’ cross county captain, will run distance and relay in addition to hurdling as well. Other cross country runners in the fall bolstering the Panthers in the distance events will be junior Brandon Hager and sophomores Liam Cafferty, Theo Kamperides and Chris MacDonald. Kline will also throw shot put, and chip in running a relay and hurdle. Junior Pat Bui fills gaps in the 55-meter dash, 300-meter dash and shot put. A look back on Week 2. The winter action is in full swing at Whitman-Hanson Regional High. Boys’ basketball (1-1) received 21 points from junior Ben Rice and 15 from classmate Colby Ahern to defeat Quincy, 63-52, in its opener Tuesday, Dec. 11. The Panthers outscored the Presidents 36-20 in the second half to erase a five-point deficit. On Friday, W-H fell on the road, 58-55, to Hingham. Sophomore Cole LeVangie paced Bob Rodgers’ club with 14 points. Girls’ basketball (0-2) fell to Quincy, 57-44, on the road in its opener Tuesday, Dec. 11. Junior Brittany Gacicia was the Panthers’ high scorer with 11. … On Friday, Jenna Olem’s team hosted and fell to Hingham, 42-34. Senior captain Olivia Johnson dumped in eight points and snatched seven boards in the defeat. 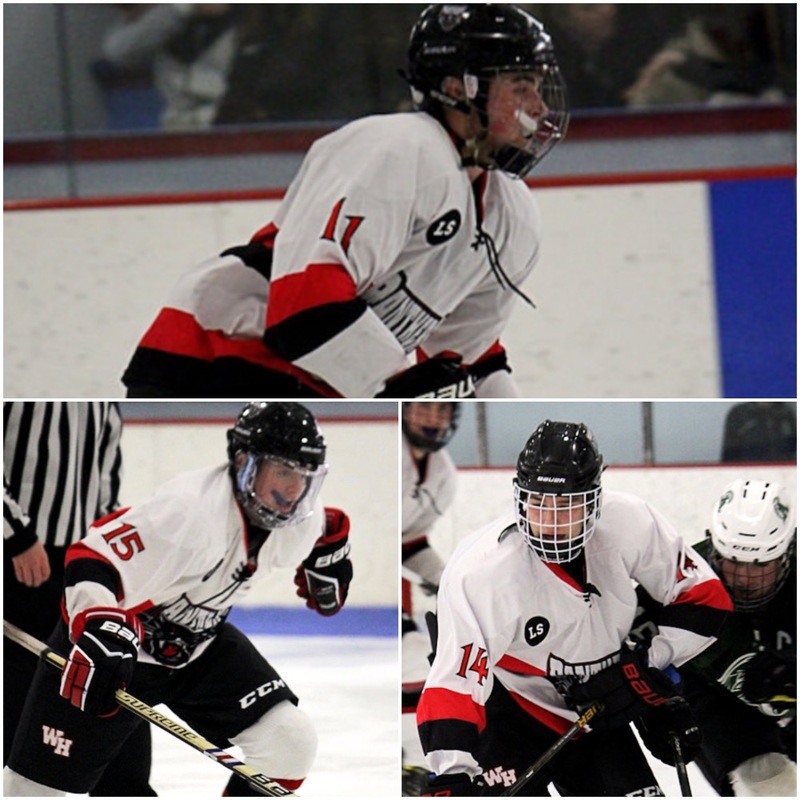 Boys’ hockey (1-1-1) skated to a 4-4 tie against Silver Lake on Wednesday, Dec. 12. Junior Eddie Collins scored twice, while senior captain Ed Scriven and junior assistant captain Adam Solari both added goals. … On Saturday, despite a hat trick from junior Chris Stoddard, W-H still fell to Scituate, 5-4, in a back-and-forth affair. 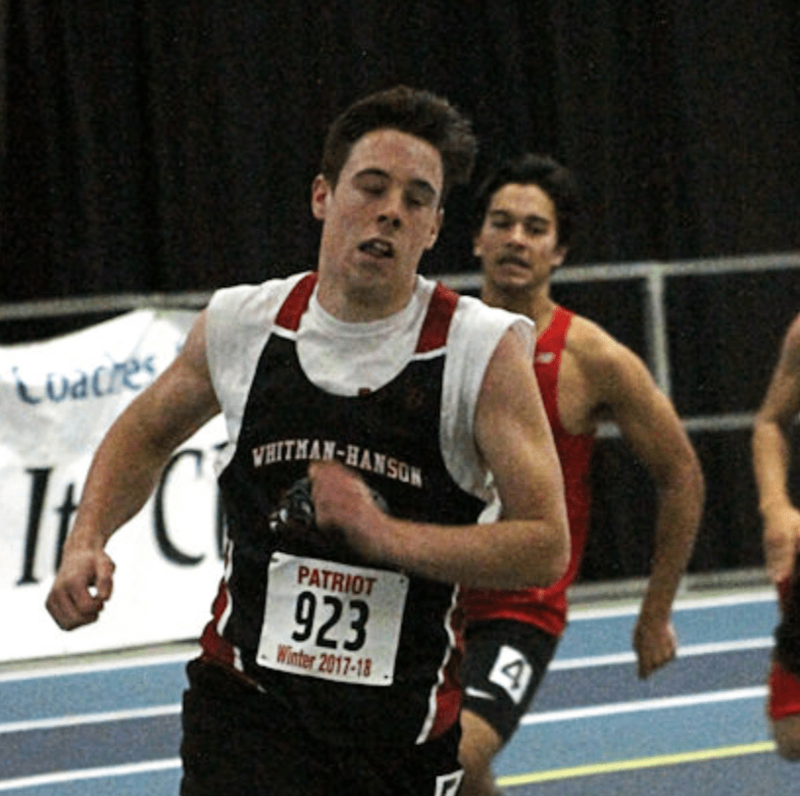 Boys’ indoor track (1-0) edged Duxbury, 51-49, Wednesday, Dec. 12. Wins came from sophomores Liam Cafferty (mile, 4:58.41) and Theo Kamperides (2-mile, 10:48.76), juniors Brandon Hager (1,000m, 2:54.19) and Pat Bui (300m, :40.85) and senior captain Dan Kline (55m hurdles, :09.62). Girls’ indoor track (0-1) fell to Duxbury, 59-41, Wednesday, Dec. 12. Senior captain Ally Bartlett (:09:70) produced a win in the 55-meter hurdles as did sophomore Izzy Amado (3:24.15) in the 1,000-meter run and senior Maeve McDonough (12:59.17) in the 2-mile run. Boys’ swimming/diving (1-1) fell to North Quincy/ Quincy, 86-78, on Monday, Dec. 10. … The co-op upended Randolph, 91-71 on Friday. Girls’ swimming/diving (2-0) swam past North Quincy/ Quincy, 99-80, on Monday, Dec. 10. In the 100-meter backstroke, junior Madison Navicky clocked in at 1:13.47. … On Friday the co-op defeated Randolph, 88-50. Navicky qualified for states and junior Nikki Kamperides set a personal-best in the 100-meter backstroke with a time of 1:23.59. Wrestling (1-8) was downed by Plymouth North, 48-30, Wednesday, Dec. 12. Wins via pin came from sophomore Matt Butler (126 pounds), senior Joel McInnis (152), junior captain Tyler Cullinan (170), freshman Jason Rapoza (182) and senior captain Christian Schneider (195). … On Saturday, the Panthers went 1-4 on the day in a super-quad meet. The victory came against Pembroke by a score of 41-39, while the losses came to Marshfield (42-39), Toll Gate, Rhode Island (42-39), Oliver Ames (60-18) and Duxbury (54-23). Butler finished the day 4-1 to lead Gary Rabinovitz’ young team. The Panthers look to snap a streak of two seven-win seasons. What was once a weakness is now a strength for the Whitman-Hanson Regional High wrestling team. The Panthers return all three of their Div. 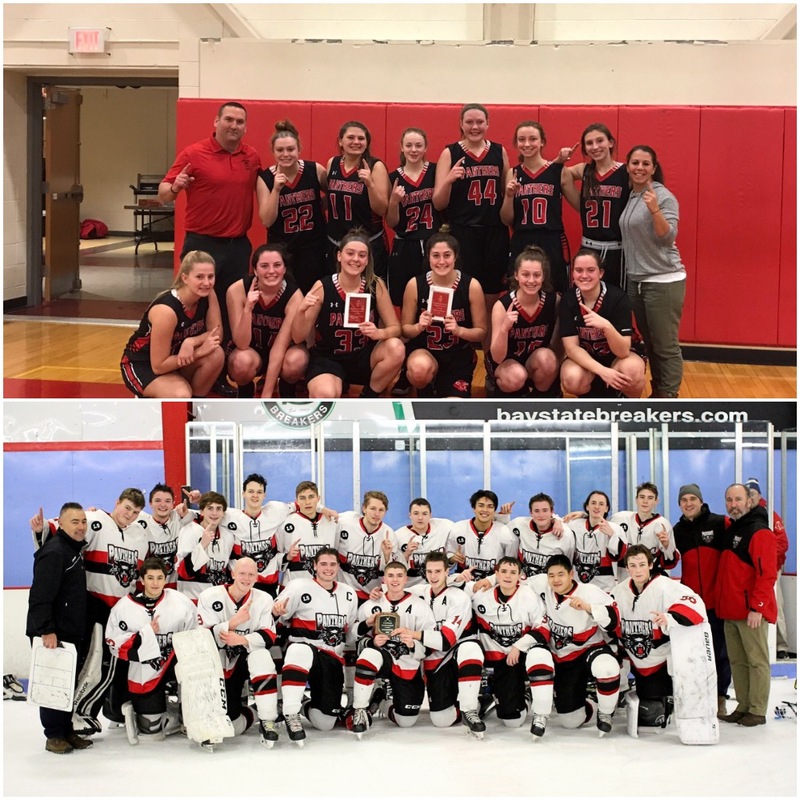 2 South Sectional qualifiers and their top two wins leaders, as they try to push past the seven-win mark, where they’ve been stuck on for the past two winters. The program’s youth is its best chance to propel it to the next level. Junior captain Steve Brooks returns to the mat to compete in the 152-pound weight class yet again after posting a team-leading 19 victories and 15 pins to qualify for Div. 2 South Sectionals last season. Sophomores Matt Butler, Damari Goldsmith-Greene and Myles McInnis headlined an impressive core of freshmen to hit the mat last season. The three combined for 38 wins. Butler returns to the 126-pound weight class after he ranked second on the team with 16 victories, placed in three tournaments and qualified for the Div. 2 South Sectionals. “Matt Butler brings a lot of energy and experience to this year’s team,” Rabinovitz said. Myles McInnis also racked up 11 victories, but in the 106-pound weight class. This winter he’ll compete at 113 pounds. His brother Joel McInnis, a senior, was the team’s other sectional qualifier after a 12-win season at 145 pounds, a weight class he’ll return to. “Both were varsity starters last season and have tons of experience,” Rabinovitz said. Junior Tyler Cullinan will serve as one of the captains and bump up to the 170-pound weight class from 160, where he tallied 11 wins last season. “Tyler surprised many as a wrestler last season with a deadly headlock that I know he will be using again this season,” Rabinovitz said. Junior Matt Rock will provide the team with some much-needed depth due to his ability to compete at both 120 and 126 pounds. Senior captain Christian Schneider is back from a knee injury and will wrestle in the 195-pound weight class. A pair of freshmen in Joe Boss (106 pounds) and Jason Rapoza (182) will be looked upon to have an immediate impact. “I look for this team to grow week after week so that we peak at the proper time, that being sectionals and then the state tournament,” Rabinovitz said. The Panthers return to mat Saturday at Dec. 15 beginning at 9:30 a.m. for a super-quad meet in Marshfield. The senior-laden Panthers went 8-3 on the season. When they were freshmen, Whitman-Hanson Regional High football head coach Mike Driscoll knew there was just something different about this season’s group of seniors. But the success isn’t what caught his immediate attention. 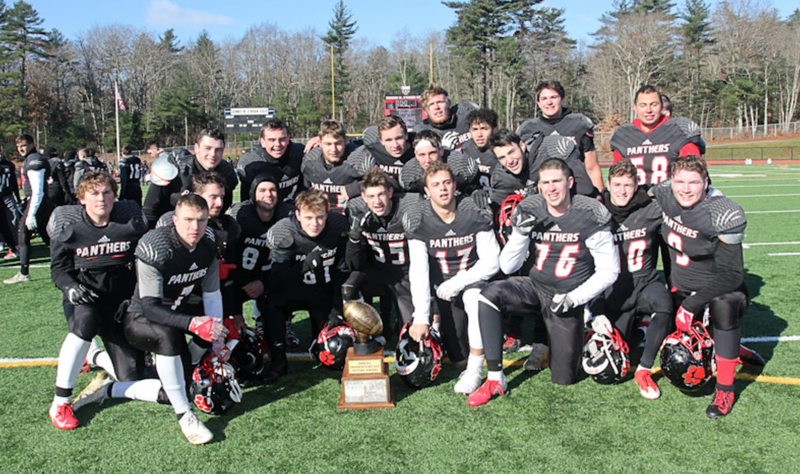 As sophomores they helped lead the team to a 7-4 season, as juniors they did the same, but in their final seasons the 16 of them helped Driscoll hit a mark he hadn’t since his first year as head coach. That’s the eight-win plateau. “I told the seniors how proud we were of them for their four years in the program, and I told the younger guys to remember how it feels and do what those kids did and just continue on what they did,” said the eighth-year head coach. The Panthers posted statement wins over Marshfield (41-13) in their opener, Quincy (39-0), Silver Lake (29-6) and Abington (16-0) on Thanksgiving. With its offense working through some changes throughout the season, W-H’s defense was its one constant, as it recorded three shutouts and surrendered just 11.7 points per game. The unit was led by senior captain and league all-star Mike Connors. The middle linebacker racked up a team-leading 100 tackles. While Connors shored up the middle, senior Billy Martell was the rock in the secondary, recording 52 tackles and three interceptions from his safety position. On offense, he chipped in 518 rushing yards and three scores. The two-way threat was also a league all-star. Senior captain Quinn Sweeney and classmate Ryan Trongone were also two-way stars for W-H on the line. Sweeney was second on the team with 85 tackles and led it with 24 tackles for loss and seven sacks en route to a league all-star selection. Trongone was second on the team with 17 tackles for loss to go with 65 tackles. Senior Nate Beath, a transfer from Pembroke, was a three-way asset for W-H due to his punting (31.8 punt average), blocking, rushing (244 yards, two TDs) and tackling (58 tackles and 5.5 sacks). 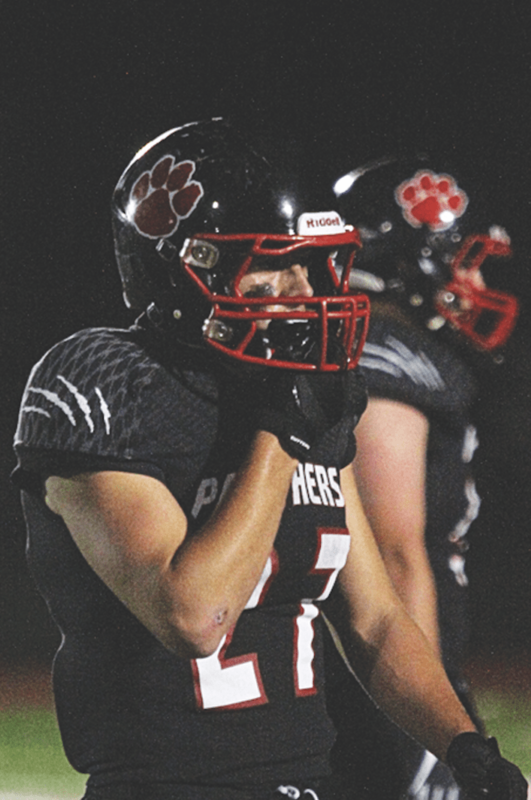 On offense, senior captain Ethan Phelps rushed for 654 yards and 12 TDs and was tabbed a league all-star. It’s tough to find one player who had a more immense impact on the offense than senior captain Rian Schwede, who switched from wide receiver to fill a void at quarterback early in the season. In an Oct. 15 win over Quincy, he ran for, caught and threw a TD. Driscoll said that while he’s graduating significant talent off this season’s roster, he’s optimistic about what the future holds for his program that finished off the year with a combined freshman, JV and varsity record of 20-1. After missing out on the tournament by two points last season, the boys’ hockey team is healthy and ready to go. After an injury-riddled second half of the season led to the Whitman-Hanson Regional High boys’ hockey team missing out on the playoffs by two points last winter, everyone’s healthy, and the team is looking to show what it can do when it has a clean bill of health. Sophomore defenseman Kevin Willis, who sustained a torn ACL last season, is one of the key players back from injury for the Panthers. He, along with classmates Jack Allen and Josh Pike and junior Reed Watson, will see significant time on the blue line. Junior forward Chris Stoddard, who was tied for fifth on the team with nine points through 12 games last winter, was sidelined for the final three weeks. This season, he’ll be joined by classmates John Hagan and Eddie Collins on the second line. “They’ve been in the program for three years,” Googins said. “There’s high expectations for that group.” On the first line for the Panthers will be senior captain Ed Scriven, senior assistant captain Owen Manning and junior assistant captain Adam Solari. All are multi-sport captains and provide the team with substantial leadership. Scriven’s 11 goals were second on the team last season, and he’ll be relied upon heavily to make up for the production lost with the gradation of league all-stars Korey Howard and Alex Uva, who combined for 27 goals and 26 assists. Manning, who was also a golf captain, scored seven goals and dished out six assists last winter. Solari’s eight-goal, 11-assist campaign last winter shined a light on what he can bring to the table. But so did his election as an assistant captain. In net, it’s a three-player battle between junior R.J. Flynn, sophomore transfer from Archbishop Williams Bobby Siders and freshman Erik Dean to take over the reins from Ricky Welch. The Panthers open the season Saturday, Dec. 8 at 3:10 p.m. at Hobomock Arenas against league opponent Pembroke.